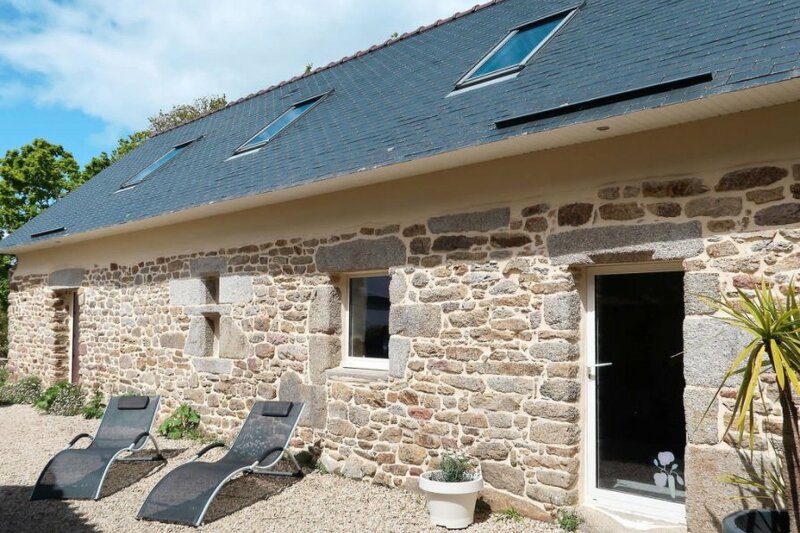 This 2 bedroom house with swimming pool is located in Trégunc and sleeps 4 people. It has WiFi. The house is near a beach. Part of terraced house, 4 people, 3 room/s, 2 bedroom/s, 1 bathroom/s, approximately 70 m², 2 floor/s. Equipment: satellite TV; CD player, radio; internet access Wi-Fi (included); iron/ironing board; electric heating; storage room (external access only). € 8 per person and stay (depending on occupancy). Electricity according to consumption approximately € 0.18/​kWh. Holiday resort tax. Linen/towels Bed linen available. Towels must be brought along. Towels available on loan, € 5 per person/​stay (on order). Deposit € 200 (in cash). Cot/​High chair free of charge (on order). Pet not allowed. Situation: in the village, in the district Kervraou. Estate (shared use with the owner and holiday guests): approximately 10000 m², partially surrounded (hedge, wall, electric entrance gate), trees, well-kept, meadow. Wellness: shared use (free of charge): outdoor whirlpool (available during the whole season). Important information: Shared use of the outside whirlpool with the guests of the other house part (2 m x 2 m, 10-12 am and 5-7 pm). Plot description: private part of the estate approximately 300 m². Terrace (roofed), furnishing provided, 2 sun loungers, transportable barbecue. The agent describes this house as a family friendly holiday rental ideal for the summer holidays. It is also good value for money. The house has a swimming pool and is located in Trégunc. The nearest airport is only 48km away. It is set in a convenient location, 3km away from a beach and 6km away from the city center.